Police has acquired the mobile phone data of Chen Zhu, the Chinese national who was shot dead in broad daylight in the city’s upscale neighbourhood, Express News reported. The incident took place on Monday near Zamzama Park. As per the statement issued by South Zone police station, Zhu, 46, was employed at a private shipping firm in Karachi. He and his coworker Ye Fan, another Chinese national, had left their office for lunch at a restaurant in Block-2 Clifton. They were in a white Honda when an unidentified assailant opened fire at them, leaving Zhu critically injured. Both Chinese nationals were shifted to the Jinnah Postgraduate Medical Centre where Zhu succumbed to his injuries. Making headway, the police investigators have begun geo-fencing the area where the attack took place. Police sources also revealed details of the forensic report, saying the 9mm pistol recovered from the crime scene had never been used before. The sources further informed the data from Zhu’s mobile phone as well as Fan’s mobile phone have also been acquired. 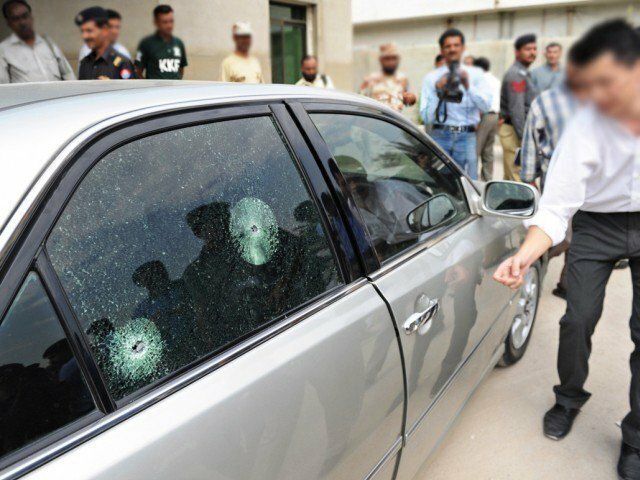 SSP Riaz further said that the case was being investigated from different angles, including business concerns and personal enmity. The slain Chinese national’s body is stored in a morgue until the completion of the investigation, following which it will be flown to China. Zhu was a resident of Lalazar Drive on the Beach Luxury Hotel Road where the company’s office is also located. He was serving as the managing director of the company since the last two years. Following the incident, security has been tightened for foreigners, particularly Chinese nationals across the province. Hundreds of Chinese citizens are working in Pakistan as part of projects in CPEC project while over 4,000 police personnel have been deployed on their security.